The grapevine (Vitis vinifera L.) is a woody vine cultivated worldwide for its edible berries (grapes) that are eaten fresh or pressed to make beverages. Most grape juice is fermented and macerated to make wine, and the remainder is used as a refreshing beverage. Grape processing generates a large number of by-products that can be broadly classified as follows: solid by-products (leaves, stems, seeds, skins, and pulp), highly viscous by-products (lees), and low-viscosity by-products (wastewater) (Bekhit et al., 2016). The seeds (pips) are sometimes extracted to make oil. This datasheet deals with grape pomace (grape marc), which is the main solid residue of grape processing. 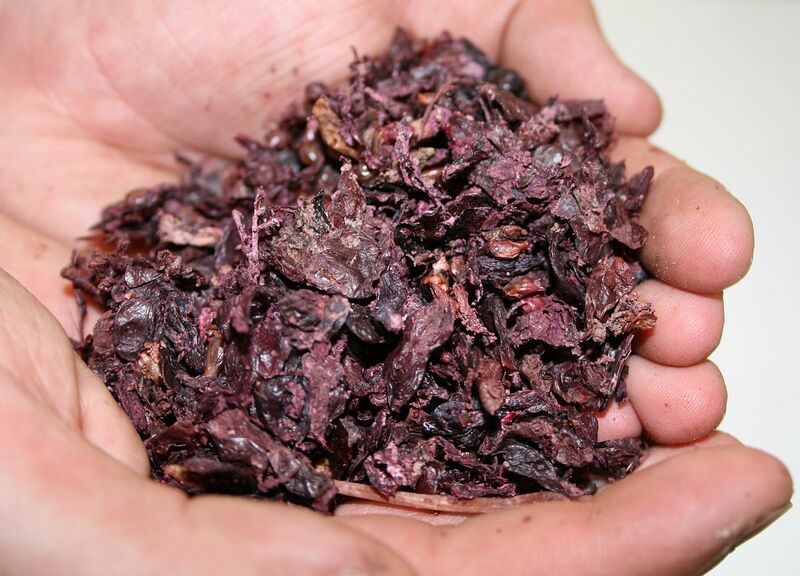 Grape pomace always includes the pressed skins and the disrupted cells of grape pulp, and, depending on the process, the stems and the seeds. Grape leaves and grape seeds and oil meal are presented in their own datasheets. The categorisation of grape pomace is difficult. More so than other food industries, wine-making practices are incredibly diverse, and, while rooted in tradition, they have been embracing changes required both by globalised consumer demand and by legislative pressure to reduce their environmental footprint. The standard vinification process consists of destemming, crushing, storage, screening, fermentation, maturation, stabilization, and bottling. However, wine producers use different process routes that have significant impacts both on wine quality and on the nature of the by-products (Letaief, 2016). As a result, the physical and chemical composition of wine and grape juice by-products depends on many factors: purpose of the crop (white wine, red wine, spirits, juice, etc. ), grape variety, grape maturity, and the wide range of techniques and machinery used throughout the process (Ye ZhiJing et al., 2016). Indeed, the nature and nutritional value of those products should be ideally determined on a case-by-case basis, a situation that has been remarked upon from the 1890s to the 2010s (Cornevin, 1892; Bekhit et al., 2016). The terminology of winery by-products can be confusing. Grape pomace and grape marc are sometimes considered to be distinct products, the marc only containing skins and pulp (Göhl, 1982; El Boushy et al., 2000). However, pomace and marc are usually used either interchangeably as synonyms, or exclusively. The European Union, for instance, defines grape marc as "the residue from the pressing of fresh grapes, whether or not fermented" (European Union, 2008). Some producers of grape by-products for animal feeds use the term "grape pulp" for the by-product without stems and seeds (Désialis, 2016), but other producers do not make a difference between pomace and pulp. Grape pulp can also be a food product composed of actual pulp (without the skins). Many scientific papers discussing the feeding value of grape pomace do not mention the physical composition of the product or its status regarding destemming or distillation, and call it interchangeably pomace, marc, pulp, winery by-product, etc. This datasheet will use the terms pomace and marc as synonyms. Grape pomace includes the skins and the pulp, usually the seeds and, in some cases, the stems. Leaving the stems with the grapes during crushing, pressing and fermentation used to be the traditional practice (Cornevin, 1892). The tannin-rich stems give the wine a more bitter, astringent and herbaceous taste. However, as this type of wine has become less popular, current wine-making practices favour destemming, and many wines are made with grapes crushed after the removal of the stems. Leaving the stems is still required for certain red wines when the organoleptic properties provided by the stems are desirable. Some white wines do not require destemming, as the stems do not come in contact with the juice during the process. Destemming can also be partial in order to control precisely the organoleptic effect of the stems (Ye ZhiJing et al., 2016; Letaief, 2016). It should be noted that in some cases this operation is done after the recovery of the pomace (Magnier, 1991). Grape pomace made of non-destemmed berries is composed of about 30% stems, 30% seeds and 40% skins and pulp, while grape pomace made from destemmed berries consists of about 40% seeds and 60% skin and pulp (Göhl, 1982). Wet grape pomace represents between 25 and 45% of the fresh berry (15% for dried pomace) (Wadhwa et al., 2013). However, other estimates suggest a value of 20% (Bekhit et al., 2016). In the EU, grape pomace is often sent to distilleries and processed to extract the residual ethanol for the production of liquors, resulting in "exhausted" pomace (Ye ZhiJing et al., 2016; European Union, 2008). It is, therefore, probable that grape pomaces available in the EU are from distilleries and have a lower ethanol content than pomaces obtained from wineries. Grape pomace, exhausted or not, can be further processed to remove the seeds (for seed oil extraction). The resulting product, which should only contain the pulp and the skins, is sometimes called grape pulp or grape marc. Because of its lower fibre content, this product has a better value for livestock feeding than other pomace. Due to its high content of fibre (and particularly lignin) and the presence of phenolic compounds, grape pomace is of low digestibility. It can be used to feed ruminants, horses and rabbits, in association with feeds having a better nutritive value, but it is not recommended for pigs and poultry as a source of energy and protein. Grape pomace can be fed fresh, but as it is highly perishable and produced seasonally, it must be dried or ensiled before storage (NRC, 1983; Demarquilly et al., 1976). Other uses include as a fertilizer or for composting. Recently grape pomace and other grape by-products have been recognized as potential sources of valuable bioactive compounds, notably antioxidants. Grape pomace is already used industrially for the extraction of anthocyanins (Ye ZhiJing et al., 2016; Letaief, 2016). Indeed, since the mid-2000s, the scientific interest in the feeding of grape pomace has been largely dedicated to investigating it as a source of beneficial polyphenols and antioxidants, notably for ruminants and poultry. The grapevine is native from a region stretching from North-East Afghanistan to the southern borders of the Black Sea and Caspian Sea. It was domesticated there around 4000 BCE and later spread to the Mediterranean Basin, Western Europe, India, China and Japan. The grapevine was introduced into the Americas by the Spaniards. It is now cultivated worldwide. In some cases, it hybridized with native Vitis species, resulting in cultivars adapted to local conditions. The grapevine is grown in both hemispheres, predominantly within 20 and 50°N and within 20 and 40°S. It can grow in tropical areas at altitudes between 300 and 2000 m. However, growth and fruit production are best below 1200 m. The grapevine requires a long, sunny, and warm season for the grapes to ripen, and a relatively severe winter that promotes plant dormancy. It withstands winter frost down to -20°C but light frosts of -3 to -5°C kill regrowth during spring, which reduces the yield of fruit. Summer temperatures of 25-30°C are optimal for shoot and berry growth. Hot and dry summers are best suited for fruit production because the risk of disease is reduced. The grapevine grows on most soils, light or heavy, deep or shallow, fertile or not, but responds to better soils with higher yields. Soil pH should be between 5 and 8, although values slightly below 7 are considered best. Light soils promote early ripening and a high sugar content. Soil texture is more important than soil fertility, and deep and well-drained soils are preferred as they favour extensive root development. The grapevine is tolerant of drought stress and will survive and grow in semi-arid areas where other crops fail. It is a full sunlight species, but it is necessary that its leaves protect the fruits from sun scorch. It should be sheltered or planted where strong winds do not occur (Ecocrop, 2016; Ketsa et al., 1991). Grapes are one of the world's most important fruit crops in area grown, production and monetary value. In 2012, grapes were cultivated on more than 7 million ha and produced 69 million t of fruits with an average yield of 9.6 t/ha. 40 million t of grapes were used for the production of wine (about 90%) and juice (around 10%, fresh or concentrated), 24 million t for fresh fruit and 5 million t for dried grapes (raisin) (OIV, 2016; Castellucci et al., 2013). The most important producers were China (9.6 million t), the USA (6.6 million t), Italy (5.8 million t), France (5.3 million t), Spain (5.2 million t), Turkey (4.2 million t), Chile (3.2 million t), Argentina (2.8 million t) and Iran (2.1 million t). The EU represents 75% of grape production and 57% of wine production. The main wine producers are Italy, France, Spain (where most of grape production is used for wine) and the USA. China is mostly a producer of fresh fruits (FAO, 2016). For 2012, assuming that 40 million t of fresh grapes are processed into wine and juice, with a residue-to-product ratio of 0.15 for dried pomace (Wadhwa et al., 2013), the amount of dried pomace worldwide can be estimated at 6 million t. This value is almost twice the value of 3.4 million t suggested by FAO, 2016 but remains of the same order of magnitude. Grape pomace is a fresh (up to 65-68% water) and perishable product, and it must be dried if it cannot be fed immediately or ensiled (Février et al., 2009). Grape pomace is usually dried in large rotary drum driers. 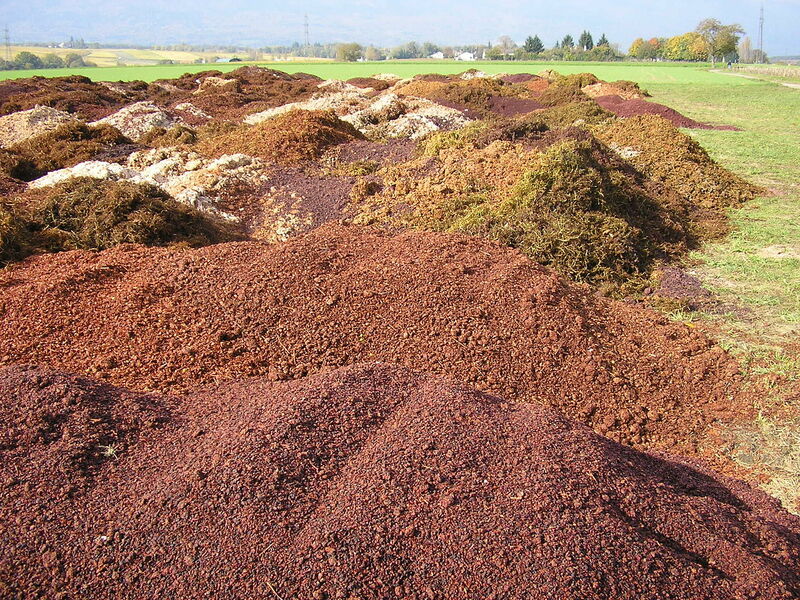 Pomace is introduced at the top where a large hot air fan is situated. The hot air is forced through the pomace, expelling gases and moisture vapour out of the drum drier. The wet pomace dries as it rotates through the drum, the supply of hot air being maintained by the drum burner. The dried pomace is then hammer-milled into a fine mash, which may be mixed with small amounts of molasses to improve its energy content and its palatability. Addition of lime can be used to bind the pectines and raise the pH (El Boushy et al., 2000). In a process described in Australia, drying occurs continuously for approximately 20 minutes, in a gas-fired rotary drum heated to approximately 120°C. The resulting dry meal is ground and then steam-pelleted at 85°C (Moate et al., 2014). Ensiling has been used in Western Europe since the 19th century as an efficient method to preserve grape pomace for winter feeding of livestock (Cornevin, 1892). In the Mediterranean area, ensiled grape pomace has been commonly used by sheep farmers as a backup or emergency feed (Reyne et al., 1977). Winery pomace can be stored for a time by heaping and pressing, but dust formation may become a problem owing to disintegration of the pulp. Because winery pomace is already acid, it can be relatively easy to ensile (Göhl, 1982) and good silage has been made by storing pomace in sealed polyethylene bags (Alipour et al., 2007). However, the presence of water soluble carbohydrates and ethanol may create conditions that do not promote lactic acid fermentation, and it may be necessary to use chemical additives (e.g. formic, acetic, or sulphuric acid) or lactic acid bacteria inoculants (Zheng Yi et al., 2012). Early feed practitioners recommended pressing the pomace and covering it as hermetically as possible. Adding grape leaves and fine straw was a common practice (Cornevin, 1892). In countries with a warm-climate, ensiling fresh grape marc with high-quality by-products, such as wheat bran or tomato pulp, was found to improve storage quality and to give a well-preserved palatable feedstuff (Chedly et al., 1999). Ensiling has been shown to reduce the content in phenolics, condensed tannins, free tannins (but not bound tannins) and saponins, thus improving the feeding value of grape pomace (Winkler et al., 2015; Spanghero et al., 2009; Alipour et al., 2007). However, this means that ensiling is not recommended when grape pomace is included at low levels in order to induce health-promoting effects (Winkler et al., 2015). In Algeria, an early trial found that treatment of grape pomace with PEG was efficient to inactivate tannins and to increase the in vivo digestibility of OM and protein in sheep. However, this treatment was not economic at the time (Larwence et al., 1984). Later trials in Iran and Spain have confirmed these findings. Treatment with PEG was shown to improve the digestibility (gas method) of grape pomace by inactivating tannins (Alipour et al., 2007). In another study PEG treatment improved in vitro protein digestibility but not in vitro DM digestibility (Molina-Alcaide et al., 2008). Treatment with NaOH has been shown to improve significantly the digestibility of grape pomace, probably by increasing the availability of nitrogen and inactivating tannins, but a too strong NaOH treatment may also inhibit microbial activity (Larwence et al., 1983b; Larwence et al., 1985). Treatment with ammonia decreased tannin content but did not improve digestibility (Magnier, 1991). Treatment of grape pomace silage with urea (up to 2% of DM) was ineffective in improving the nutritive value of the silage (Eraso Luca de Tena et al., 1992). Grape pomace and other grape processing residues, when released in the environment, can lead to serious pollution, ranging from surface and groundwater pollution to foul odours. They also attract flies and pests. The use of these products for fertilizers or composts on soils can cause an increase in nitrogen leaching and oxygen depletion due to the presence of tannins and other compounds (Bekhit et al., 2016). Disposing of pomace as fertilizer back into the vineyards may cause phytopathological issues (Baumgärtel et al., 2007). These products also contain heavy metals. Better environmental management of these wastes and their utilization for other purposes, including livestock feeding, is increasingly necessary, and there is strong legislative pressure in that direction (Bekhit et al., 2016). It is possible that grape pomace is still underused in animal feeding: in the late 1980s, it was estimated that only 3% of grape pomace produced in the Mediterranean area was fed to livestock (Magnier, 1991). Grape pomace is a highly variable product. Not only does it contain variable proportions of pulp, stems, seeds and skins, but grape cultivars, fruit maturity, and the production process (winery, distillery, juice) all have effects on its composition. However, in spite of this variability, grape pomace is a feed of moderate to low nutritional value. Its protein content is about 14% of DM (11-16%) and its fibre content is generally high (ADF of 55% DM ranging from 43 to 66%) with exceptional levels of lignin (33% of DM, varying from 19 to 46%). Pomace containing only skins and pulp has a lower lignin content (17-26% of DM), though still much higher than that of most feeds (Bekhit et al., 2016). Grape pomace contains 4-8% of DM as lipids, due to the presence of its oil-rich seeds. Other components are also variable and depend, for instance, on cultivars and processes: pomace from red wine production contains residual yeast biomass and ethanol in addition to fermented grape material, whereas pomace from white wine production contains higher levels of water-soluble carbohydrates and less ethanol (Zheng Yi et al., 2012). Sugar content can vary from 4-9% (red wine pomace) to 28-31% of DM (white wine pomace) (Baumgärtel et al., 2007; Winkler et al., 2015). Grape berries and their by-products, particularly the seeds and the skins, contain important though variable amounts of phenolic compounds, particularly flavonoids, which include anthocyanins, flavonols, and flavan-3-ols (catechin, epicatechin) (Chedea et al., 2016). Condensed tannins (proanthocyanidins) are polymers of flavan-3-ols of different molecular weights (Ye ZhiJing et al., 2016). Grape pomace can contain as much as 20% of DM as condensed tannins (Molina-Alcaide et al., 2008). These compounds form complexes with proteins in the feed and with digestive enzymes leading to disruption of the digestion process and to loss of nutrients. They also interfere with mineral absorption, causing damage to the mucosal lining of the gastrointestinal tract (Bekhit et al., 2016). Vinification methods influence the tannin content of grape pomace: particularly, higher fermentation temperatures and extended maceration times increase the release of phenolic compounds in the wine, and reduce their amount in the by-products (Ye ZhiJing et al., 2016). The high tannin content of grape pomaces is, together with fibre, one of the main reasons for their low digestibility and low nutritive value. Flavonoids are recognized as antioxidants, with positive effects on the prevention of oxidative damage in tissues by the reduction of lipidic oxidation and/or blocking the production of free radicals (Letaief, 2016). For that reason, the inclusion of small amounts of grape pomace in the diets of ruminants, poultry, and pigs, is being investigated for its potential beneficial effects, both on animal health and on the quality of animal products. The effect of grape pomace tannins on the reduction of methane emissions by ruminants is also being studied (Moate et al., 2014). There have been reports from Brazil of lethal intoxication of sheep fed grape pomace derived from grapevine treated with copper-based fungicides (Reis et al., 2015). The grapevine is treated with a variety of pesticides. In Australia, an assessment of animal products derived from livestock fed grape pomace treated with registered pesticides found that the risk of residues was low with the majority of chemicals (MacLachlan, 2010). Fresh grape pomace normally spoils readily. Depending on the conditions and on the nature of the product, it can remain edible for up to a week (Février et al., 2009), but it can also become inedible in less than 24 hours (Hentges et al., 1982). Grape pomace has long been used to feed ruminants, though its use varies widely depending on the region. In the 2000s, its seasonal use was still reported in major wine growing regions such as France, Spain, Greece and the South of Australia, but it was little used in Germany (Baumgärtel et al., 2007). Grape pomace is generally seen as having low to moderate nutritional value, depending on the amount of stems, seeds and tannins in the product. Its feeding value has been found to be comparable to that of a hay or straw (Demarquilly et al., 1976; Hentges et al., 1982; Magnier, 1991; Winkler et al., 2015). Because of its low feeding value, grape pomace is more valuable for ruminants at maintenance or for low-producing animals, and should always be fed with supplementary protein and energy. A 10-day transition is recommended when introducing it into the diet. Grape pomace is more suitable for sheep and goats than for cattle, though it can be given to beef cows and heifers (Magnier, 1991). 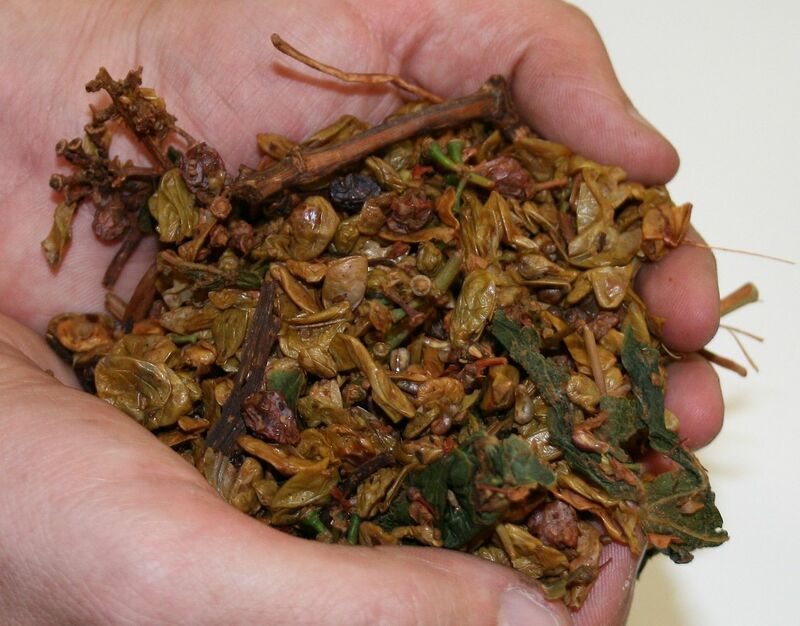 Since 2000, research has focused on the potential benefits of grape pomace phenols on animal health, product quality and environmental issues, such as N excretion and methane emissions. Grape pomace has long been described as being palatable to ruminants. Sheep were observed to select the seeds and the skins and to discard the stems when fed whole pomace (Cornevin, 1892). Sheep consumed 90 to 130 g DM/kg W0.75 (1.5-2,5 kg/d for a 60 kg sheep) of fresh or ensiled grape marc. Intake was lower for dried pomace and exhausted pomace. Grape pomace without seeds and stems was also palatable but intake was slightly lower (50 to 122 g DM/kg W0.75) (Magnier, 1991). Fresh grape pomace fed to grazing yearling heifers and beef cows was found very palatable. Beef cows could consume up to 13.6 kg of pomace in 2 hours (Hentges et al., 1982). In vitro and in vivo digestibility of grape pomace is generally low to very low, with few exceptions, in the 25-35% range (Magnier, 1991). In vitro DM digestibility of pomace from 3 grape cultivars in cattle, sheep and goat ranged from 26 to 36%, the lowest values corresponding to the highest content in phenolics (Oluyemi et al., 1982). In a comparison of 2 types of winery grape pomace, in vivo OM digestibility ranged from low (red wine, 32%) to medium (white wine, 56%). The first pomace had 31% NDF and 4% sugars while the other had 51% NDF and 27% sugars (Baumgärtel et al., 2007). However, another trial found red wine pomace to have a better OM digestibility than white wine pomace (39 vs. 32%) (Winkler et al., 2015). A comparison of red and white grape pomaces gave higher in vivo OM digestibility values for white grape pomace (39 vs. 32%) (Zalikarenab et al., 2007). A trial in China with fistulated sheep concluded that 2.25 g/kg DM condensed tannins from grape pomace improved the apparent digestibility and retention of feed protein (Zhao Dong et al., 2014). Rumen degradability was also found to be low. Some authors reported values in the 25-40% range for DM effective degradability (Molina-Alcaide et al., 2008; Abarghuei et al., 2015), while other authors reported values lower than 20% (Sarcicek et al., 2002). There is a wide range of N degradability, from very low values (less than 20%) reported for juice pomace (Abarghuei et al., 2015; Sarcicek et al., 2002), to values in the 40-50% range (Molina-Alcaide et al., 2008). Grape pomace is generally not recommended for dairy cows as it tends to depress milk yield (Magnier, 1991). Early trials showed that grape pomace without stems could be fed to dairy cows in amounts up to 6.5 kg/d and was a good feed when supplemented with concentrates and legume hay, though at this level of inclusion the milk yield tended to drop and the butterfat content increased. Larger amounts caused inflammation of the mucosa in the digestive system (Göhl, 1982). In Greece, dairy cows were fed a diet containing 20% ensiled wet grape marc without affecting DM intake, milk yield, milk composition, and body condition (Belibasakis et al., 1996). In Australia, the feeding of dried grape marc (5 kg DM/d) instead of alfalfa hay to dairy cows in late lactation had no effect on milk yield or concentrations of protein and lactose in the milk, but milk fat concentration and, consequently, yield of milk fat was reduced. With the same amount of ensiled grape marc there was no effect on the concentrations of milk fat, milk protein, and milk lactose, but milk yield and yields of milk fat, milk protein, and milk lactose were all reduced. The feeding of both dried and ensiled grape marc resulted in milk fat with enhanced concentrations of MUFA, PUFA, and cis-9, trans-11 linoleic acid (Moate et al., 2014). Since 2000, studies have investigated the potential benefits of the flavonoids and antioxidants contained in grape pomace. In Denmark, dairy cows fed a high protein diet supplemented with 4.5 g/d of grape pomace did not show any significant improvement in yields of milk and protein (Nielsen et al., 2004). In Romania, dried grape pomace included at 3 to 5 kg/d had no effect on milk yield and composition (Nistor et al., 2014). In Germany, supplementation of dairy cows with 1% grape seed and marc meal extract (containing 5.2% polyphenols) from week 3 prepartum to week 9 postpartum increased milk production. There was no significant effects on inflammation and the occurrence of endoplasmic reticulum stress in the liver of dairy cows during early lactation (Gessner et al., 2015). Other effects of grape marc flavonoids on dairy metabolism have been researched. In New Zealand, cows receiving 3 kg DM/d of grape pomace excreted 22% more N in faeces compared with the control group, had a lower plasma urea nitrogen concentration and unchanged urine urea concentration. This altered partitioning of N toward the faeces instead of absorption could be beneficial when feeding diets high in rumen-degradable protein (Greenwood et al., 2012). In Australia, dairy cows fed 5 kg DM/d of dried or ensiled grape pomace showed a 20% reduction in CH4 emissions without a concomitant reduction in DM intake. These reductions in CH4 emissions were associated with changes in the rumen bacterial and archaeal communities (Moate et al., 2014). Most trials involving growing beef cattle show that including grape pomace above 10% of the diet is detrimental to performance. In Cyprus, the inclusion of dried grape marc at 15% and 30% of calf fattening diets reduced killing-out percentage but increased feed intake, thus reducing efficiency of feed utilization. At 30% inclusion live-weight gain was reduced (Hadjipanayiotou et al., 1976). Similar results were obtained in a trial in California, USA, where dried grape pomace mixed at 20% to replace barley in finishing steer diets had no effect on gain or carcass composition but increased intake by 15%, which was detrimental to feed efficiency (Hentges et al., 1982). In Chile, steers fed diets containing up to 15% grape marc showed decreasing live-weight gains 45 days into the trial. Body weight, carcass yield, dorsal fat and loin eye area were also negatively affected (Manterola et al., 1997). Likewise, negative results on daily gain and feed efficiency were obtained with young cattle fed 15 to 22.5% grape marc in the diet (Stojanovic et al., 1989). Not all trials were negative: in Romania, replacing barley by dried grape pomace (20% of the diet) for fattening steers did not affect performance (Voicu et al., 2014). Grape pomace was fed at up to 35% of the diet of beef cows with low requirements (Magnier, 1991). In Cyprus, lambs fed diets containing 30% grape marc as a substitute for barley made similar live-weight gains as the lambs fed the control diet, but consumed more feed, thus feed efficiency was lower. It was recommended to use diets containing 10-15% grape marc with a source of nitrogen (Economides et al., 1980). In Greece, sheep fed diets containing up to 40% grape marc for 10 days showed decreased protein digestibility when it was included at 20% and above (Fegeros et al., 1987). In Iran, feeding male lambs on diets containing up to 10% dried grape pomace (from juice production) improved growth as well as the triglyceride level. 15% and above in the diet was detrimental to growth and feed efficiency (Bahrami et al., 2010a; Bahrami et al., 2010b). In Spain, feeding lambs with a small amount (5%) of dried red grape marc did not affect intake, daily gain, carcass yield and carcass characteristics (Guerra-Rivas et al., 2013b). In Romania, feeding above 125 g/d of dried grape pomace was detrimental to growth (Nistor et al., 2014). A study in China was more positive, in that lamb diets containing 8-16% of grape pomace improved feed conversion efficiency, daily weight gain, carcass characteristics and nutrient utilization (Lu ZhenZhen et al., 2015). In Greece, grape marc included at 19% in the diets of dairy ewes increased PUFA concentration in the milk as well as the concentration of cis-9,trans-11 CLA and vaccenic acid (C18:1 trans-11) (Tsiplakou et al., 2008). However, a study in Spain with ewes fed 5 or 10% red grape wine pomace (combined with 2.7% linseed oil) concluded that grape pomace did not affect the percentages of total saturated, monounsaturated, and polyunsaturated fatty acids (Manso et al., 2016). In Spain, the effect of grape pomace in the diet of lactating ewes on their lambs was investigated. Diets containing 5 or 10% of red grape wine pomace resulted in lambs having higher levels of vaccenic acid, rumenic acid (C18:2 cis-9, trans-11) and a higher n3:n6 ratio in the intramuscular fat, though the PUFA and saturated fatty acids were not affected. The lipid oxidation during storage was lower for the meat of lambs whose dams were fed grape pomace (Guerra-Rivas et al., 2015a; Guerra-Rivas et al., 2015b). In Greece, grape marc included at 19% in the diets of dairy goats had little or no effect on the fatty acid profile of milk (Tsiplakou et al., 2008). Grape pomace has a low nutritive value for pigs due to its high fibre and tannin contents, so there is little information regarding feeding it to pigs. In Australia, dried winery pomace included in pig diets decreased feed efficiency when fed at 15% and above, and decreased weight gain when fed at 20% and above (Farrell et al., 1983). In France, destemmed grape pomace was included in pig diets at up to 20% (Février et al., 2009). Since the year 2000, grape pomace added in limited amounts (5% or less) has been investigated as a source of beneficial proanthocyanidins, flavonoids and fatty acids. Feeding piglets a diet containing 3.5% (DM basis) red grape pomace increased the number of colonic bacteria (Streptococci, Enterococci, Lactobacilli), and positively influenced the mRNA expression pattern of immunological marker genes in white blood cells (Sehm et al., 2011). In Korea, feeding finishing pigs with a diet containing 3% dried grape pomace fermented with Saccharomyces boulardii had a positive effect on average daily gain, DM and N digestibility, altered the fatty acid profile of the subcutaneous fat (reduced saturated fatty acids and increased PUFA) and meat quality attributes (marbling score, redness and yellowness values, anti-oxidative ability) (Yan et al., 2011). In Romania, the addition of 5% dried grape pomace in the diet of growing pigs increased the concentration of n-3 fatty acids (particularly α-linolenic acid) in the longissimus dorsi muscle (Habeanu et al., 2015). Grape pomace has a low nutritive value for poultry due to its high fibre and tannin contents, and there is little information about its use for feeding it to poultry. Most of the work done since the year 2000 concerns the use of grape pomace for its potential benefits on health and product quality. In Australia, dried winery pomace included in broiler diets decreased feed efficiency when fed at 12% and above, and decreased weight gain when fed at 18% and above (Farrell et al., 1983). Later studies have tested much smaller amounts of grape pomace, usually between 1 to 6% of the diet. Several studies in Spain have looked at the effects of grape pomace or grape pomace concentrate on broiler meat quality, gut flora and morphology (Chamorro et al., 2015). Grape pomace added at 0.5 to 3% of the diet for broilers reduced the lipid oxidation of meat during refrigerated storage and increased liver α-tocopherol concentration (Goñi et al., 2007). A grape pomace concentrate (containing 15% condensed tannins) included at up to 6% in broiler diets did not impair chicken growth, digestive organ size, and protein digestibility. There was increased antioxidant activity in diet, excreta, ileal content, and breast muscle. It was as effective in antioxidant potential as vitamin E. In a later experiment, a diet including 6% of the similar grape pomace concentrate increased the biodiversity of intestinal bacteria and modified gut morphology in a way potentially favourable to nutrient absorption (Brenes et al., 2008; Viveros et al., 2011). In Iran, red grape pomace (from juice production) included in broiler diets decreased broiler performance linearly when added at more than 2%, but it also increased blood glucose level and plasma antioxidant content (Khodayari et al., 2014). In Romania, grape pomace included at 2% in broiler diets had a slight positive effect on performance (Pop et al., 2015). In the USA, feeding grape pomace has been tested successfully to induce molting before the second laying phase (McKeen, 1984). In Turkey, the addition of up to 6% grape pomace in the diet of laying hens did not significantly affect performance, egg quality, and serum total cholesterol, total protein and triglyceride levels. It also reduced egg yolk malondialdehyde (MDA), which may improve egg shelf life (Kara et al., 2016). Grape marc has been used for horses at up to 10% of the diet (Göhl, 1982). Economides, S. ; Hadjidemetriou, D. G., 1974. The nutritive value of some agricultural by products. Technical Bulletin 18, 12 pp. Economides, S. ; Georghiades, E., 1980. Grape marc as a substitute for barley grain in diets of fattening lambs. Technical Bulletin 29, 8 pp. Mavrogenis, A., Louca, A. and Lawlor, M. J., 1973. The use of grape pulp, grape seed meal and barley straw in lamb fattening diets. Tech. Bull. No. 12, Agric. Res. Inst., Nicosia, Cyprus, 8 pp. Motta Ferreira, W. ; Fraga, M. J. ; Carabaño, R., 1996. Inclusion of grape pomace in substitution for alfalfa hay, in diets for growing rabbits. Anim. Sci., 63: 167–174.